Scotland’s four-time World Champion John Higgins produced a magnificent display, including a 147 break, to down Gerard Greene 4-0 at the BetVictor Scottish Open in Glasgow. Higgins eased into a 2-0 advantage after making a break of 83 in the second frame. What followed was a moment of magic in front of the 30-time ranking event winner’s adoring home crowd. He fired in a spectacular 147 break, the ninth of his career. That puts him in line for a £22,000 payout, if no other 147s are made this week. Higgins then went on to wrap up the win thanks to a clearance of 32, which allowed him to pinch the fourth frame on the black. The Scot now faces an intriguing last 32 encounter with the talented 18-year-old Yan Bingtao. 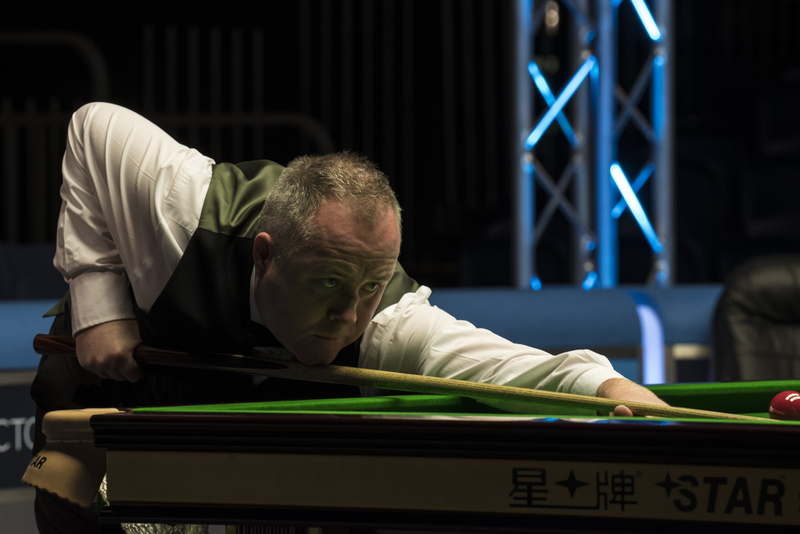 It was a remarkable turnaround for Higgins, who just two days ago revealed that he had suffered a broken rib and has talked recently about considering retirement following struggles with his form and a heart breaking 18-16 World Championship final defeat to Mark Williams. Higgins said: “I got a great ovation at the end there. It was some crowd. It was brilliant and is just one of those things. I think that is the first time I have had a buzz this year since the Crucible. “When I was practising in the house I felt something. I felt a little bit better and I thought maybe I could take it out into the game and play well today. Luckily I did and it culminated in that break. Higgins’ compatriot Ross Muir secured one of the biggest wins of his career, beating defending champion Neil Robertson 4-2. The Scot, who top scored with 98, admitted after the match that he had to battle through eye problems to secure the victory. Muir said: “It is certainly up there with the best moments of my career. Beating someone like Neil is very good. These players don’t give you anything and you certainly need to earn it. I was really struggling with my right eye. I’ve been to numerous GPs and opticians and have been diagnosed with being prone to eye migraines. 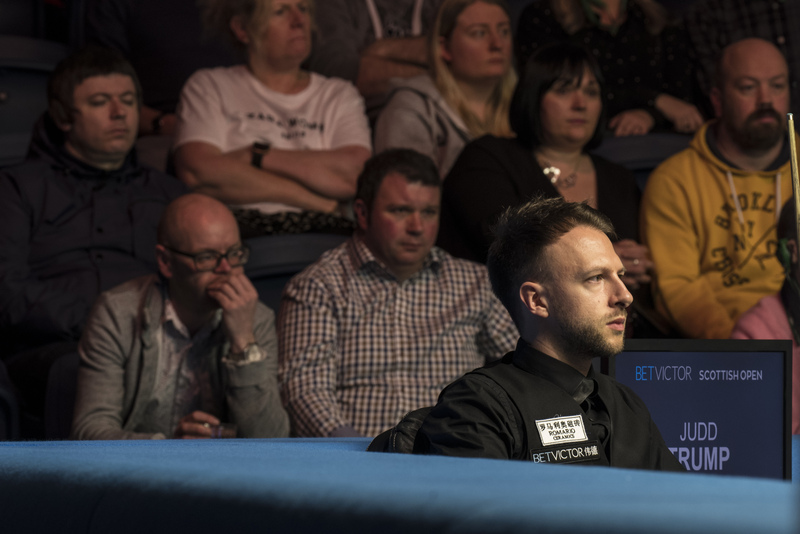 Recent Northern Ireland Open champion Judd Trump put on a blistering display to brush aside Leicester’s Ben Woollaston 4-0. Trump fired in breaks of 102, 50, 66 and 119 to storm to an impressive victory. He faces China’s Zhang Jiankang in the last 32. Chinese number one Ding Junhui made breaks of 76 and 111 in a 4-1 win over world number 30 Robert Milkins. Mark Allen is also through to the last 32 after defeating Chen Feilong 4-1. 2005 World Champion Shaun Murphy defeated Michael Holt in a whitewash 4-0 win. While Kyren Wilson also secured a clean sweep of the frames, beating Paul Davison 4-0.